The art of stained glass is an ancient art form that never went out of style. It can be adapted and used in any kind of decor and style, either classic or contemporary, modern or period reproduction. Installing a stained glass panel is a beautiful way to add colour, originality and elegance to your home or office, to public as well as private spaces. 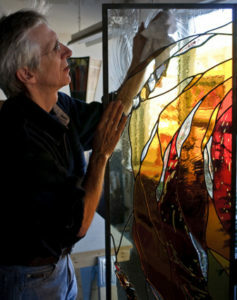 The well-known and highly respected Jean-Pierre Léger leads Ô Vitrô, a collective of stained glass artists from Quebec. For more than 35 years, Mr. Léger has mastered his craft beautifully. He is adept at creation as well as restoration, having worked on numerous residential, commercial and institutional projects. You are invited to discover more about our services by consulting our different headings. We will be happy to guide you in your choice, if you so desire (see Studio). 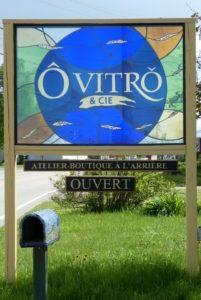 Ô Vitrô & cie also operates a boutique where one can find a collection of objects and works chosen from some glass artists throughout Quebec. We offer jewellery, vases, plates, window decor and much more (see Boutique).